In today’s technological world, most Internet users are no longer limited to accessing the World Wide Web through their personal computers or laptops only. In fact, a majority of people nowadays access the Internet through portable devices such as smartphones and tablets. This has created the need for developing a website theme and template that is capable of being accessed through mobile devices while still retaining the same performance level and user-friendly appearance. Luckily, there are now numerous choices when it comes to the creation of a website that is capable of being accessed from both personal computers and mobile devices. These responsive (responsive is the term used to describe the nature of a site that can be viewed on other devices aside from desktops) website themes are all good choices when it comes to creating a fully accessible site. So we will be listing 20 of the best choices for both experienced and non-experienced webmasters and web designers. Continue reading through this article now and determine which one of these 20 mobile responsive WordPress theme fits your needs best. HowTo is a professional grade WordPress blog theme that is made not only to be amazing in terms of appearance but is also completely responsive to any and all devices that are capable of accessing the Internet. This WordPress theme can minimize the amount of work one must do when creating a website using this theme template. The developers of HowTo have created an amazing template that consists of layout options, easy navigation (very important for the improvement of user-experience on your site), and readability optimization. This theme also consists of a few features that allow users to easily manipulate and customize several elements of the website such as the theme, the menus, the navigation, widgets (such as social media sharing buttons and tools), and even the page layout. 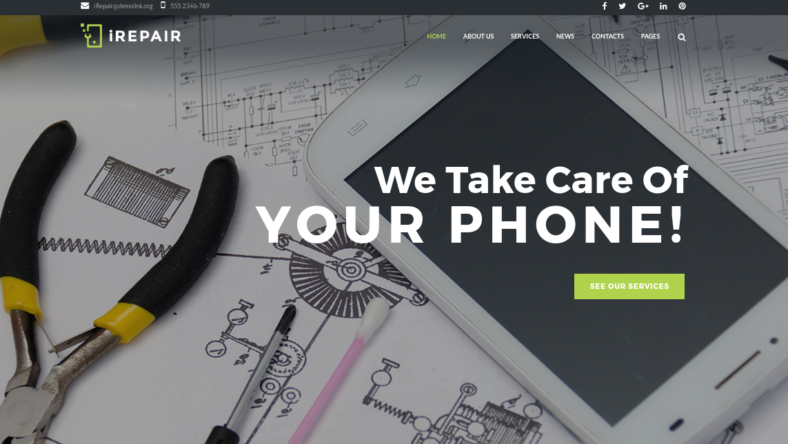 If you are ever planning on creating an online website to support and advertise your electronic repair business or company, then you are definitely in need of a stylish and responsive WordPress theme and template. Meet iRepair, this responsive WordPress theme has cross-browser compatibility, which is a useful feature that allows users to access the site from a variety of web browsers. This WordPress theme is not only professional in terms of appearance but can also simplify the process of creating an amazing gallery to showcase all of the content and services of your site, making it easier for the ones visiting your site to navigate through your contents. Sweipe is a fully responsive WordPress mobile theme that is not only beautiful and fast to access on any personal computer but the same level of speed and performance is also available on mobile phones and tablets. Purchasing Sweipe not only gives you access to the tools and features for the creation of your own site but it also allows you to use the demo theme to reduce the total workload of creating a site to just minor changes and revisions. This WordPress theme is the perfect choice especially for someone who has little to no experience in site management and creation. This is because the WordPress theme also includes several guides and instructions in both written texts and video, making an inexperienced site maker capable of learning on the spot with little assistance from other people. 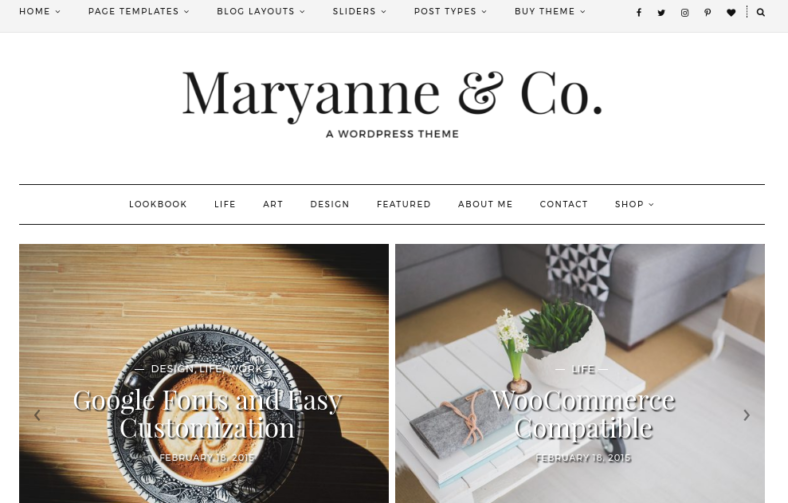 Maryanne is a classic blog WordPress theme that implements clean coding as well as a minimalistic design. This ensures top performance, making it a good choice for those who wish to create a website that can be accessed even with a slow Internet connection. Despite being a minimalistic WordPress theme, it features several customization options that will allow you to adjust your site to your preference, making it more likely for you to create a website theme that matches your preferences. This freedom of customization is thanks mostly to the implementation of the live view customizer feature that allows you to easily manipulate every aspect of website. Looking for a simple-to-use yet modern and creative-looking responsive WordPress design? Then Claire is exactly what you need. This responsive WordPress theme is made with several design options when it comes to selecting the post style of the website, the page layout, and even the design and functions of several widgets. This freedom of customization ensures that whatever website you are going to use the WordPress theme for will not only appear exactly how you want it to look but function flawlessly. This responsive WordPress theme is even capable of supporting the addition of several media files along with other similar files and documents. This features allows you to create a dynamic and content-filled website that will make your site viewers constantly interested and entertained. There are several other features and functions that this WordPress theme has which makes this WordPress theme and template an effective theme template. myPortfolio is a responsive WordPress theme and template that is both user- and SEO-friendly. This WordPress theme allows you to customize every element of the website from the layout of each page to the post format being used to display the contents of your site. 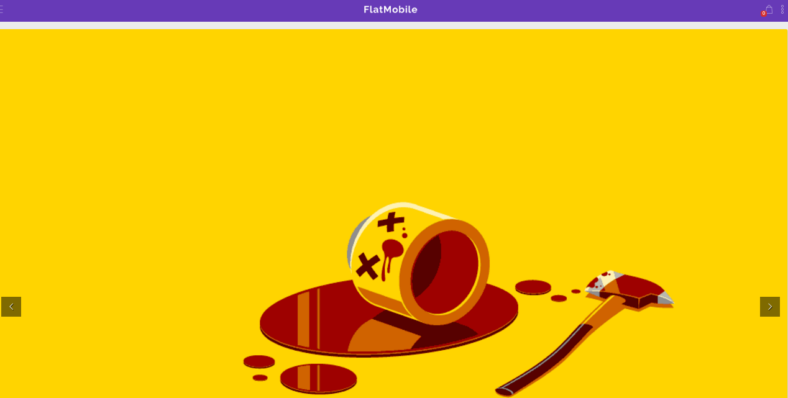 FlatMobile is a responsive WordPress mobile theme that is minimalistic as well as highly functional. This WordPress theme has a drag-and-drop page builder function that allows for the easy uploading of content and media files onto the site. It also consists of several customizable widgets and features that further improve the performance of the website. This WordPress theme has an options panel that gives you plenty of choices on how to approach the customization as well as alteration of the web pages of your site. This option panel even allows you to view the changes you are making to your site in real time, making it easier for you to determine what changes you need to make in order to design your website. 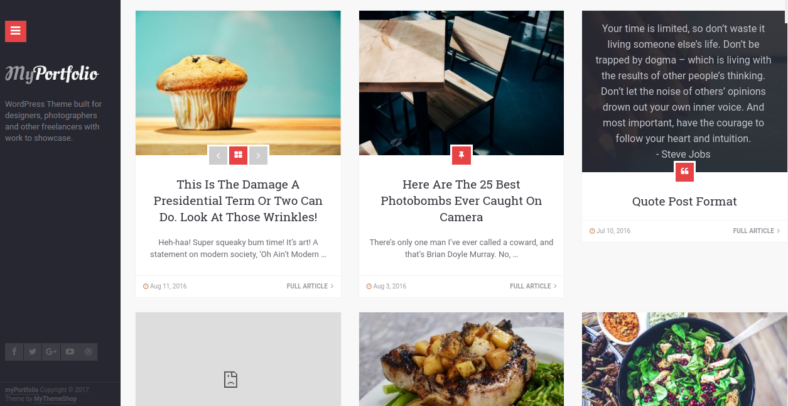 Linda is an extremely stylish responsive magazine WordPress blog theme template. With its gorgeous design and its numerous potential design choices, this WordPress theme is definitely a great choice for those who want to create a beautiful and responsive website. This WordPress theme has numerous page and post layout options that you can choose from. It also features an easy customizer tool allows you to alter the site to meet your standards. The theme also supports the addition of different types of files and media documents. Elevator is a creative and easy-to-customize business template that can be perfect for studios, agencies, companies, and designers. The theme can easily display or show off their content in a way that will intrigue or interest your site visitors. This portfolio WordPress theme is capable of displaying your media files and documents in a gallery format for an easy means of navigation and organization of any and all content and information on the site. NewsPaper is a beautiful and elegant media responsive WordPress theme that is capable of supporting tons of media uploads. This WordPress theme is also made to function responsively to whatever device it is being viewed on. It also consists of multiple post layouts so you can pick the layout or design you want to implement in terms of displaying your content. This WordPress theme is perfect for the creation of a variety of websites such as personal blogs, magazine sites, tech reviews, sports site, etc. 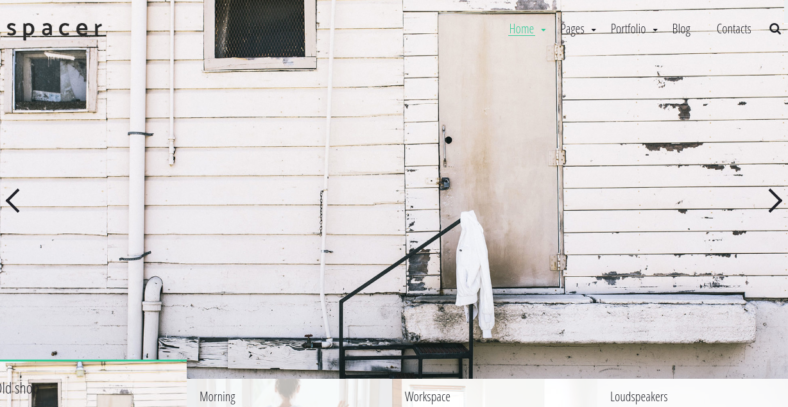 Spacer is a photography WordPress theme that is ideal for use on a media-filled website with contents that are almost guaranteed to peak the interest or curiosity of other people. This WordPress theme consists of a variety of slider options that will assist you in displaying your content on a single page, as well as page and post layouts that will help you decide what type of layout or arrangement you will use for your website. This WordPress theme allows site managers and content editors to easily manage and customize the necessary elements of the website so as to reach the expected quality for their site. 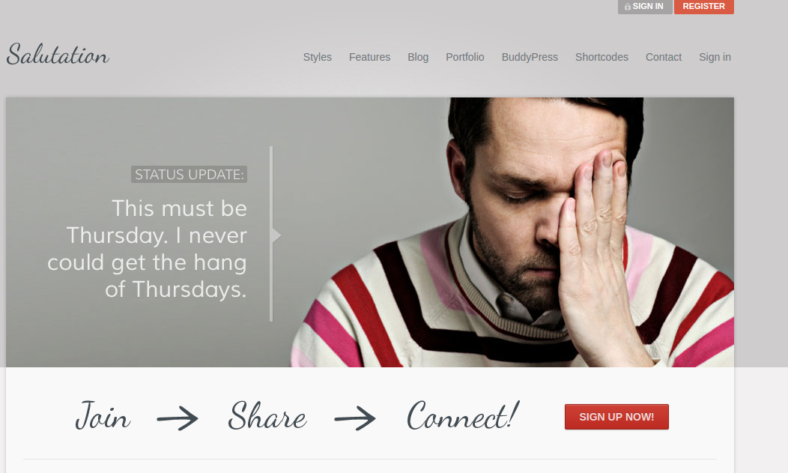 This feature is exactly why this WordPress theme and template is a necessary tool for site masters and site managers. 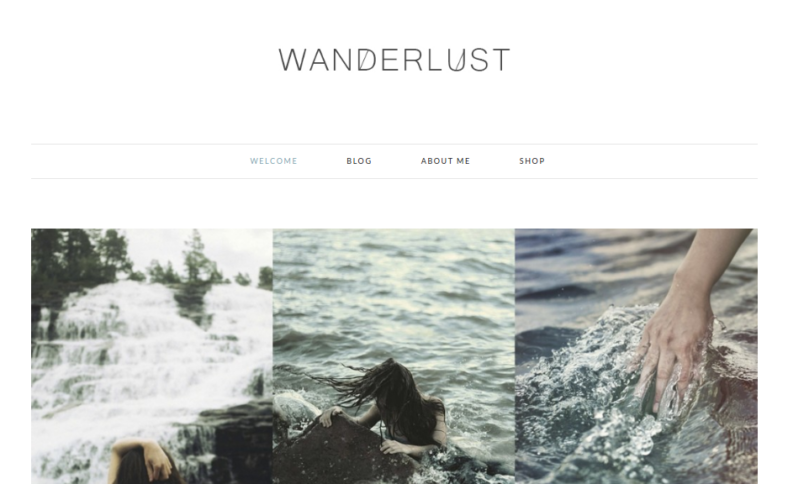 This responsive WordPress theme is known as Wanderlust and it can help you create a simple yet very powerful website. The theme has customizable links, menus and layouts that will allow you to design your website in a way that is not only eye-catching but also highly functional. 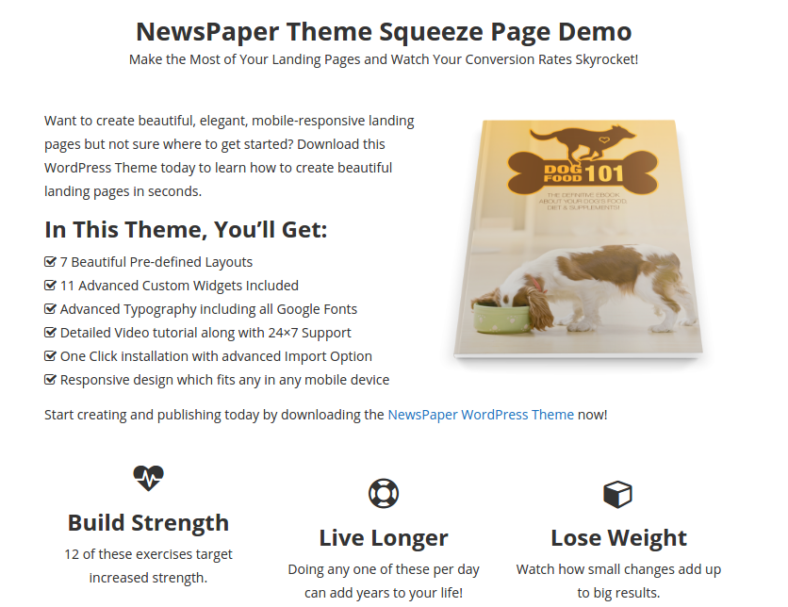 This WordPress theme allows the person the option of creating a landing page for their website. 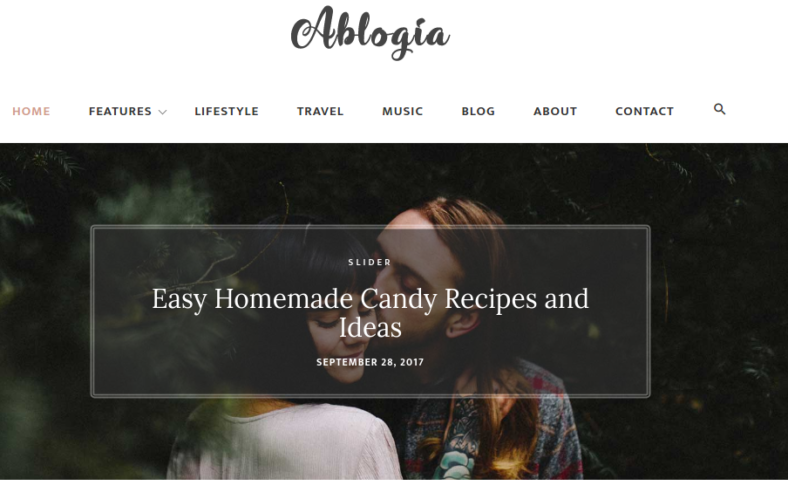 Ablogia is a fully responsive WordPress blog theme that implements clean coding and supports an amazing design. The HTML coding is so simple that the process of editing the codes is as simple as changing a few variables. However, this WordPress theme makes the act of coding not only optional but also unnecessary, thanks to the implementation of several features and functions such as the dynamic theme options. With its cross-browser compatibility and responsive design, using this WordPress theme template allows for the creation of an effective and highly compatible website that can be accessed using any browser on any device without reducing quality or performance. This makes this WordPress theme perfect for the creation of any type of website such as blogs, news sites, fashion reviews, business sites, etc. Salutation is made to be used as both a WordPress theme as well as a BuddyPress theme (this theme is essentially a network plugin for social media sites implemented into a WordPress theme to create a fully functional and interactive social media or community-orientated web site). This responsive multipurpose WordPress theme has a clean design that is capable of supporting the uploading and streaming of high level content such as media and other files. Thanks to its BuddyPress function, it is also capable of creating an interactive user-to-user chat system that will allow for greater interaction and support from the online communities, which is a useful perk to have when creating a website such as a blog or a social media site. 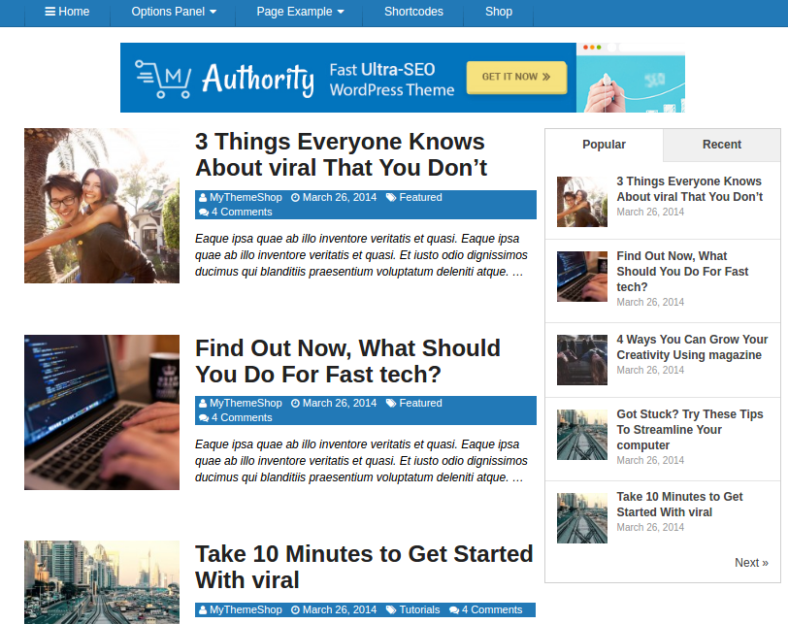 If you are ever in the need of an AdSense optimized WordPress theme that is not only professional in appearance but is also fast and reliable, then Authority is the WordPress theme and template for you. This WordPress theme is SEO-friendly and integrated with social media sites. It also has a function that will allow site visitors to easily view and focus on the topic being displayed by removing from view any and all elements deemed unnecessary when it comes to viewing the content. 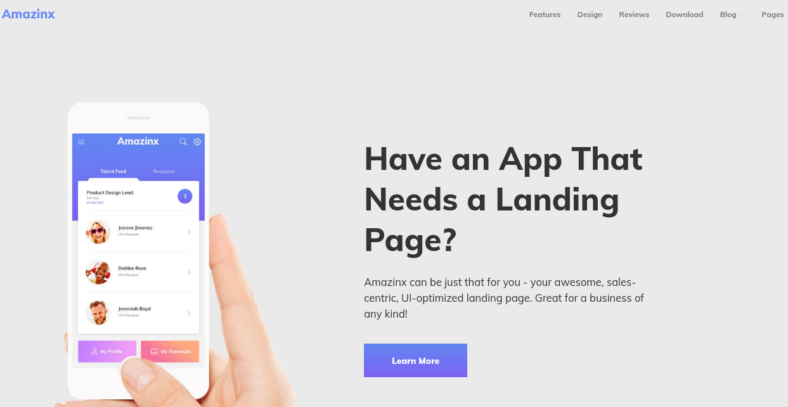 Amazinx is a responsive mobile app WordPress theme that is fully responsive and cross-browser compatible. It is the perfect theme template to use for the creation of a site that targets people who are accessing the Internet from any device using whatever web browser they have on their smartphones or tablets. The theme is minimalistic in nature, which helps in reducing the usage of network data. This is especially useful for people using mobile network data to connect to the Internet. Aside from being minimalistic in nature, this WordPress theme is also quite customizable allowing for a greater deal of editing or customization of the site to your requested preferences. Looking for a responsive WordPress theme that also functions as a minimal WordPress theme? Then Sophie is for you. This minimal theme is designed to be gorgeous, clean, and simple. The theme has all of the necessary tools and features you will ever need to create and design your website, making it even more impressive in terms of functionality. Having a minimal design requires fewer data and resources to run which is always an effective means of saving mobile data for your users so they can browse through your content for longer periods of time. Flipmart is a fully responsive eCommerce WordPress theme that is made with clean coding techniques. It features an elegant design that is almost guaranteed to catch the attention of your site visitors. This WordPress theme is excellent when you want to create an online store that is accessible to desktop and mobile phone users. 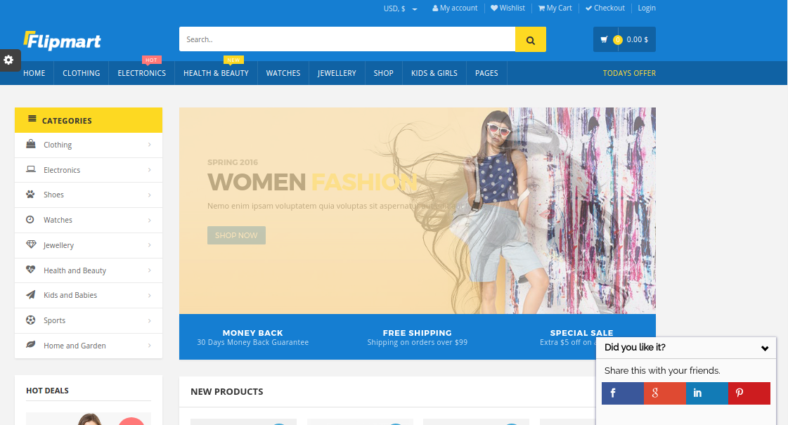 The online store theme template is capable of supporting whatever type of online store you aim to create for selling various products and services. SociallyViral is made to be a beautifully designed WordPress theme that is capable of supporting a variety of content while still being responsive to whatever device it is being viewed on as well as maintaining its performance speed and function. This professional WP theme is a favorite of experienced website makers and webmasters. With all these great themes available to you, which one is your choice?